Although Love in the place of rats and Excess Baggage and Claim – both published by the independent Melbournian press transit lounge – arrived in the mail together, it was the disquieting title of Paul Hardacre's second poetry collection that grabbed me first. I immediately flicked to read his bio on the last page and found out that he is a prolific thirty-something publisher (managing editor of papertiger media) dividing his life between Chiang Mai and Brisbane. He has spent time (rather than having 'travelled') in Myanmar, Singapore, Pakistan, Hong Kong SAR, Indonesia, China, New Zealand, Ireland, the Netherlands, the United States, Italy, India, Cambodia, Vietnam, Laos PDR, and Malaysia. For two weeks now I've been carrying his slight, handsome collection graced with a single photograph (by Sam Shmith) of a dark, windy sky on the front and the storm lifting with hope on the back cover. I read it on foot and trams. While walking I seem to constantly get lost on each page, and the same happens to me on trams. But when I stop moving and sit in a caf?¬©, I throw out my bookmark; because Love in the place of rats begins on every page, on every line. Open it where you please; and there is no end to its fragments jotted down, ideas in capsules carefully savoured, created with a chisel, recorded with a paintbrush. The collection is dedicated to 'she-of-one-hundred-&-eight-names', and she is all over it. Who is she? Time, movement, or indeed simply the poet's girlfriend? At the end of my journey through Love in the place of rats, I decide to read the acknowledgements purely to find extra clues, and I learn that 'place of rats' is apparently the indigenous name for those suburbs surrounded by the Brisbane River just south of the CBD – South Brisbane, West End, Highgate Hill, Hill End, Dutton Park and parts of Woolloongabba. I'm not so happy about finding a literal reference for the title so easily, having its mystique destroyed so quickly. But it's a great title all the same. People hate rats; and love is, well, often far away from the comforts its fulfilment promises. Travel promises love fulfilled through experience itself; whilst spending time in a place suggests a deeper engagement, and commitment. It is this conflict that makes Hardacre's unwieldy Love in the place of rats such a rich result that demands to be read and re-read. One will ultimately find escape inside oneself, if that's what one is escaping from. 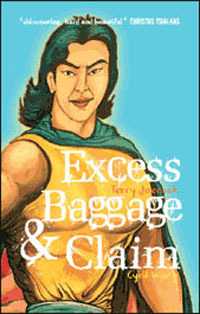 In contrast, Excess Baggage and Claim by Melbournian Terry Jaensch and Singaporean Cyril Wong is much more matter-of-fact. Again, the authors appear to be two thirty-somethings trying to make sense of what matters the most: love. One of the voices is an Australian tourist, the other a Singaporean local. Both are gay men. Their words sing to the world, melting the gulf between Singapore and Australia into one universal exploration of love and lust. am not to be trusted. Jaensch's brutally honest words make me immediately warm to his persona that is reminiscent of Christos Tsiolkas's. In fact, Tsiolkas's own endorsement of Excess Baggage and Claim adorns the front cover of the book: 'shimmering, hard and beautiful'. Not unlike Tsiolkas's protagonist in the novel Dead Europe, Jaensch's tourist arrives on strange shores feeling out of place, clammy, over-compensating the attempt to take it all in his stride. He makes the reader wonder if it matters where one is from, or where one is going, when one is in the familiar company of oneself. a lucid moment – a wind or caution thrown to. Jaensch strikes one hell of chord, as he is not complacent. 'There is such a thing as too much comfort!' he writes in the poem 'Haw Par Villa', quoting from a father who claims that with comfort comes eternal gratification. But Jaensch believes that love is not static, but rather an ever evolving entity, even if it is with the one person. his face at that first meeting. offered to buy me a drink. out to anyone, even myself. Whilst Jaensch is constantly asking the reader something, Wong ends up answering himself by beginning with the question of the quote and then delivering an answer through the rest of the poem. But Jaensch's words are more self-centred, internalized, whilst Wong's poems read like short stories, or succinct first person scenarios. The directness of the language ensures that the reader can't sidestep the most confrontational scenarios that recur in Wong's collection of poems, especially the looming figure of a sexually abusive father. Wong both tells us and lets us feel his own escape mechanism through Singaporean pop culture's mix of Bollywood, Almodovar films and Ming dynasty period dramas. In 'Are You On Tonight? ', for example, he takes us on stage to feel what it's like to perform in front of an audience of your own good and evil ghosts. In 'Turn Around.' Wong is stuck in the deepest blues, and contemplates a life of not being able to 'sing all of my dwindling days' due to throat cancer. The constant presence of sickly sweet pop music in both Jaensch and Wong's work ties this collection into one, but what makes it a compelling collaboration whilst retaining two individual voices, is the two author's referencing of each other's poems. At times they are subtly intermeshed leaving you wondering if they are talking about each other – only to find out that they're not. But when in one poem Wong says 'I went to a Karaoke pub once and did it with an Australian in one of the rooms', I find myself rereading Jaensch's karaoke adventures, and, whilst looking for references, I discover new meaning in his poems. I then go back to Wong and feel the same thing happening again. This endless exchange – between the two poets' philosophising and sharing their experience in love; between what is and what isn't love; between being Singaporean and being an Australian abroad; between memories conscious and subconscious – is what makes Excess Baggage and Claim as enduring as the pop music referenced in the poem, and the conversations we have to this soundtrack; as our lives go on, with memories evolving, and we lose and find ourselves in love. Moses Iten is a Melbourne-based freelance writer, DJ, radio host, editor and curator. This entry was posted in BOOK REVIEWS and tagged Cyril Wong, paul hardacre, Terry Jaensch. Bookmark the permalink.